Back in 1943, it was the Canadians who first successfully converted a Lancaster into a passenger carrying aircraft, complete with faired over nose and tail sections and additional windows in the rear fuselage. These early aircraft served with Trans-Canada Air Lines (TCA) ﬂying regular services across the North Atlantic from Dorval (Montreal) to Prestwick in Scotland. By 1944 Avro recognised the usefulness of such an aircraft and that year began production of the 691 Lancastrian. Learning from the success of Victory Aircraft-converted Lancasters, Avro raised the capacity of the fuel tanks located in the bomb bay from 400 to 500 gallons, which gave the aircraft an excellent range of over 4,500 miles. The nose and rear tail cone were made much longer and more aerodynamic than the early Canadian aircraft and all passengers were located in the rear of the aircraft, behind the main spar. For the RAF, the C Mk 1 and Mk 2 carried 9 passengers and the C Mk 4 carried 10 to 13 passengers, all designed to Speciﬁcation C/16/44. The Avro 691 Lancastrian was a Canadian and British passenger and mail transport aircraft of the 1940s and 1950s developed from the Avro Lancaster heavy bomber. The Lancaster was named after Lancaster, Lancashire; a Lancastrian is an inhabitant of Lancashire. The Lancastrian aircraft was basically a modified Lancaster Bomber without armour or armament and with the gun turrets blisters replaced by streamlined metal fairings, including a new nose section. The initial batch was converted directly from Lancasters; later batches were new builds. 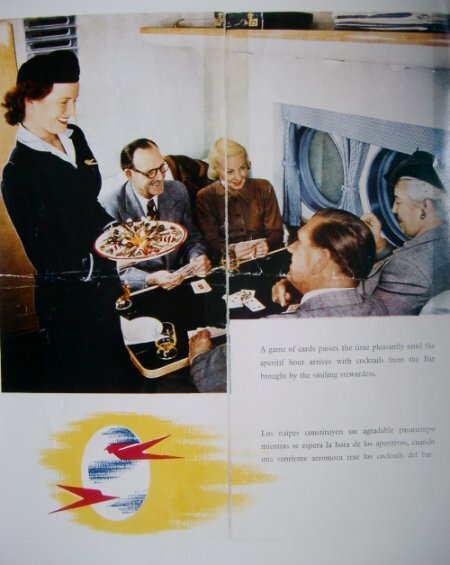 British Latin American Air Lines (BLAIR) was formed on 25 January 1944 by shipping interests (Royal Mail Lines, Pacific Steam Navigation Company, Lamport & Holt Line, Booth Steamship Company and Blue Star Line) to complement the shipping services to South America, at the end of 1945 the company was renamed British South American Airways Corporation. Chairman of the new company was W J Booth. The initial aircraft – until the Avro Tudor II was available – would be Avro Lancasters converted by Avro into the same configuration as Lancastrians and the crews were being sought from former Pathfinder Force members: the General Manager former Air Vice Marshal Don Bennett had been the Force Commander during WW2. The single route to be flown was Hurn (Bournemouth) – Lisbon-Bathurst-Natal-Rio de Janeiro-Montevideo-Buenos Aires. Starting in October 1945 Hurn had served as London’s transatlantic airport until Heathrow opened to the airlines in mid-1946. Between 1938-50 Langley was the site of the former Hawker Siddley aircraft factory, Hawker built the famous Hurricane, The Hawker Tornado (1940), Typhoon (1940), Tempest (1942), Fury (1944), Sea Fury (1945), and the General Aircraft Hamilcar X tank-carrying glider (1945) all made their first flights from Langley. Postwar, the aerodrome was also used by Airwork Ltd and British South American Airways for aircraft maintenance work all on the former site of Parlaunt Farm. Langley Airport was a grass field, but had 2 Large “runways” marked out on the grass. Langley’s grass runway was not suitable for jets and because of the proximity of Heathrow, London’s new airport they had to request permission when taking off. Then it was just large enough to be used by BSAA (British South American Airways) Lancastrians, Yorks and Tudors. BSAA used Langley as their maintenance base from 1946, sharing the facilities with Hawker. The aircraft were indeed lightly loaded when arriving and departing, there were still some hair-raising departures when the grassed runway was soft. In those instances the ta, e-off started from the hard standing. 1949: BSAA absorbed by BOAC and leave Langley. 1958: Hawker moved their factory and thus leave Langley. The Ford Motor Company opened a commercial vehicle component factory at Langley Airfield in 1949, and then bought the entire site from Hawker Siddeley in 1959. The former aircraft factory was reused for commercial vehicle manufacture and the Ford Transit was built there until production was transferred to other sites. ……down the A4 towards Slough and up Sutton Lane by Colnbrook to the Langley Aerodrome. The car park was at the Northeast corner which meant we had to walk through 2 rows of hangars to get to our workplace. Ford’s occupied the 1st row where they were back then assembling Fordson Tractors, and it wasn’t long before they banned us from walking inside which meant that, in inclement weather, we could get very wet. All Langley flying required flying permission from Heathrow as their main runway was E-W whilst Langley’s grass strip was basically NE-SW. In 1948, Captain Peter Duffey joined British South American Airways, flying the Lancastrian, and Tudor. He had some time on the Berlin Airlift, and flew to Santiago, Chile through many ports of call, and across the Andes to Buenos Aires. When BSAA was taken over by BOAC he was kept on the South American route for several years, but flying the Canadair Argonaut. In 1952 he joined the Comet 1 fleet, and served on that until its grounding in 1954, (he believes he is the only airline pilot to have flown both the 1st Jetliner, and the Concorde). Returning to the Argonaut until 1956, he then flew the DC7c, the first airliner capable of non-stop westbound flights from London to New York. In 1961 he left the North Atlantic to fly to the East on the Comet 4. Soon he was a Training Captain, and transferred to the Boeing 707 in 1965, becoming a Training Captain on that type for about 10 years. In 1975 he was nominated as one of the 8 pilots to form the nucleus group to bring Concorde into service.